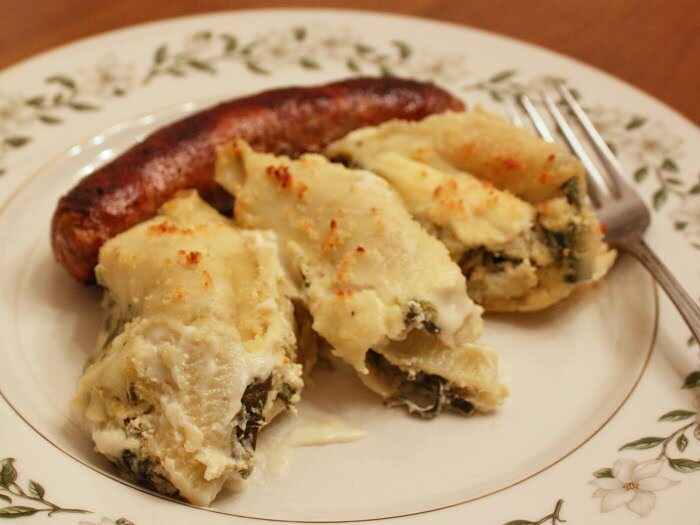 I love cooking with leftovers, and this artichoke and spinach stuffed shells recipe is a perfect example of why. There's something very satisfying about turning a dish of tired leftovers into a vibrant new creation. It's also great exercise for your cooking muscles, which should never be confused with your following-a-recipe muscles. When you follow a recipe, you're tying to manipulate food into something fabulous that fits some beautifully idyllic description, or looks like some photoshop'd picture in a cookbook. When you're cooking with leftovers, you don't have as lofty of a goal. In fact, your usually just trying to keep something from going straight into the bin. Much like a sports team that has nothing to lose, and plays great because of their free and easy attitude, the same thing often happens when cooking with leftovers. In fact, if I weren't so jetlagged, I'd come up with some brilliant metaphor for living life with this same approach. Due to dangerously high quantities of food at our Super Bowl party (by the way, how 'bout dem bones! ), I found myself with a significant amount of leftover spinach artichoke dip. I've always enjoyed spinach and ricotta stuffed pasta shells, so I thought I'd see if I could turn this fairly unattractive dish of food into something slightly less unattractive. As you'll see from the video, I think I succeeded. The would have been too long had I included the making of the béchamel sauce, but we've done that one many times, and you can see that recipe video here. I just made a standard batch of white sauce, and tossed in a handful of grated Gruyere. Anyway, I hope this video inspires you to take a look around the fridge, and fearlessly, and without any grand expectations, make something into something else. Enjoy! Technical Note: Do not adjust your monitors! This was filmed at my mom's home on a dark winter's day, so the lighting is not very good. Although, it is kind of fitting for the subject. You should have added some crab. Kidding; it looks wonderful. I haven't yet found gluten-free big shells which would put this technique out of my reach, but I'm thinking the same thing with corn tortillas...a sort of enchilada things. Of course it would require green chile in the mixture but hey, I would have put it in the dip in the first place. Question for you, Chef. Your posting on the dip recipe says you were planning to tweak it. Did you make changes for the version you did for the Super Bowl? I am thinking of doing this dip for a gathering this weekend and eyeing the leftover fat free sour cream in the fridge. BTW: I shared your posting on the super bowl bones divination with this group, many of whom do divination of various sorts for real, and they all just howled. There was discussion of peanut shell divination for baseball season, etc. i LOVE the peanut shells idea!! We've been talking about what amounts to this exact same dish on a food forum I frequent. But the context was re-using creamed spinach leftovers as opposed to dip. I'll also submit that instead of topping with more bechamel, it would taste great topped with marinara sauce and mozzarella. If you do it that way you've basically got manicotti, just with a different pasta shape. Yum! Left-over spinach dip is great as a filling for bread dough. Just roll out the dough into a square, spread a thin layer of the dip, roll like a jelly roll. Cut a few vent holes on top, apply egg wash and bake at 350 for about 20 min until the dough is golden brown. It's really good! I was looking for a stuffed shell recipe and of course came to your website first to seek you sage advice and I found this video. I found your site though allrecipes.com about 2 years ago after I thought that putting the egg salad I had made two days earlier into a frying pan to make a "scrambled egg" concoction, would be a good idea. You can imagine how that turned out. I was so frustrated with myself I vowed to learn how to cook. Sure I could do prepackaged stuff or grill a burger, but I didn't know how to cook. I love the words and the theme of this video...just try it! I've had so many meals over the last two years, even following recipes, taste awful. But, I've learned why I failed each time. Through trial, and many errors I have perfected several recipes, sauces, and now am moving on to breads. I really love the tone and tenor of your message in this, and all of your videos...you are the boss, try it! You instill confidence. The way I look at it is if I am stupid enough to try to cook egg salad in a fry pan I am willing to try anything at this point. Being creative with food was never a thought for me. I thank you for instilling confidence through your videos, what you do really does impact and make a difference in people lives. At QVC Learning How to "Move Product"